Villa Anita is a charming villa that was recently restored villa in Chianti between Florence and Siena. 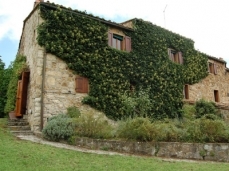 The villa beautifully sits on a 30 acre estate with vineyard, olive grove and private forest. The villa is in a very private and quiet spot and yet, it is walking distance (15-20 minute walk) to the charming village of San Donato in Poggio where you will find a bakery, coffee bar, butcher shop, restaurant, pharmacy, tourist office and other shops. The villa is composed of 3 floors. There is a huge living room of about 40 m2 and a fully furnished eat in country kitchen with dishwasher, wood burning oven, large refrigerator, freezer and a formal dining room for 8 people. There are 4 bedrooms and all the bedrooms have en suite bathrooms. Two of the bedrooms have additional sofa beds comfortably accommodating 10 people. The bedroom upstairs is air-conditioned. The house is beautifully furnished with many Tuscan furniture, and antiques, befitting the style of the house. There is a covered car park that can accommodate up to 5 cars in the villa. The guests can relax in the lovely pergola for dining outside with a splendid view of the pool and the well maintained garden. From here the villages of Chianti Greve, Panzano, Castellina and Radda are in easy reach to explore. The guests can go to the nearby winery or the stream or go on hiking in the woods where they have the lovely picnic tables. This is a nice place to spend your vacation with various activities at leisure.